Everyone can look at drawings in different ways, and I have looked at this schema for almost a year now, and here is what I have grown to see. We start with the Tau Cross. The Tau Cross is our habit, of course, so it represents the individual Secular Franciscan, you or me. The ball that envelops us is our fraternity, our world. The fraternity is our world. Framing the ball is the triangle, symbolizing the Trinity. That Trinity of Father, Son and Holy Spirit not only is the life of the world, but also the life of the square, which is our four-cornered Church: one, holy, catholic and apostolic. The Church is greater than the world, greater than our fraternity? Yes, we work out our salvation in fraternity out in the world, but we are framed by the Church, the visible sign of God’s salvific grace, God’s people, the Mystical Body of Christ, always enlivened by the dynamism and vitality of the Trinity. Any sufficient explanation of the Blessed Trinity of Father, Son and Holy Spirit certainly exceeds the capabilities of this reporter and the limitations of this Report. Similarly, the Church’s four corners of being One, Holy, Catholic and Apostolic escape the limits of this report. One individual symbolized by the Tau Cross will be approached at the end of this report. The major focus then will be on that circle of life, that circle of our world: the Fraternity and the six priorities set by the National Fraternity to build Fraternity: Formation, Spiritual Direction, Communication, Youth, Vocations and JPIC/Outreach. Why the focus on Fraternity? On the one hand, Fraternity is essential to our Secular Franciscan call. "In these fraternities the brothers and sisters, led by the Spirit, strive for perfect charity in their own secular state" (Secular Franciscan Rule 2). "The vocation to the OFS is a vocation to live the Gospel in fraternal communion. For this purpose, the members of the OFS gather in ecclesial communities which are called fraternities" (General Constitutions Article 3.3). On the other hand, from my vantage point, the Fraternity is becoming "an endangered species." According to the Collated Annual Report ending on December 31, 2012 from 27 of our 30 Regions, the number of our active professed members, the numbers of our Candidates and the number of actual fraternities in the United States are all decreasing and have been doing so pretty consistently in recent years. I thank our beloved National Vice-Minister Elaine Hedtke for the labor involved in coaxing and coercing information for the Annual Report, and I thank all the Regional Ministers who participated for your annual reporting to us. Our information is only as good as what you provide us. By these admittedly incomplete and thus imperfect numbers, NAFRA, the Secular Franciscan Fraternity of the United States, has around 13,003 active, permanently professed members nationwide, with 1565 inactive. I reported around 13,328 active, permanently professed members in my 2012 Annual Report; 13,420 members in my 2011 Annual Report, and around 14,000 in my 2010 Annual Report (14,399 in one tally and 14,079 in another). In 2009 we reported 14,722 active, permanently professed members, which itself was a decline of 1,089 from the 2008 number of 15,811. By individual members, that is 2,808 fewer active, permanently professed Secular Franciscans in the last six years, an average decline of 468 each year. To fill those missing seats at the Secular Franciscan table, we currently have 1056 Candidates, down from 1156 Candidates in 2012, down from 1206 Candidates in 2011 and 1224 Candidates in 2010; and 710 Inquirers, which is up from 688 Inquirers in 2012, but down from 865 Inquirers in 2011 and 927 Inquirers in 2010. Let us all pray for their successful formation and discernment, as well as pray for more Inquirers and Candidates into our great Order. We report 606 canonically established fraternities, a drop of only 7 from 613 canonically established fraternities in 2012, which was a drop of 40 from our 2011 number of 653 fraternities, which was a decrease of 35 from our 2010 number of 688 fraternities. In the last six years, we have reported a total drop of 112 canonically established fraternities from the 2008 number of 718, an average loss of about 19 fraternities a year. Yes, the reported decline for 2012 is less than the six-year average both for active, permanently professed members (325 to 468) and for canonically established fraternities (7 to 19), but I don’t see this as any cause for celebration! The Collated Annual Report from the Regions records 33 "Emerging Communities," down 8 from last year’s 41; and 31 "Newly Forming Groups," down 5 from last year’s 36. What do these numbers mean? Well, on the one hand, can we stop death? As I have reported before, in our 2010 Report to CIOFS, the Secular Franciscan Order in the United States has less than 1 percent of its permanently professed members under 35 years of age; only 8 percent are 35 to 50 years old; 35 percent are 50 to 65 years old; and 56 percent are 66 and over, and I can only guess how many are well over 66! Frankly, we are an aging leadership of an aging Order. On the other hand, seriously, what is the Holy Spirit calling us to do? I believe the Holy Spirit is challenging us all to offer a spiritual reality, an ecclesial community, sufficiently vital to attract and keep new life, new membership, new fraternities. Thus, I will repeat and keep repeating what I wrote in my 2011 Annual Report and spoke about in my 2012 Vision of our Order: "Perhaps no aspect of the Secular Franciscan life should be of more concern to those called to leadership than the vitality of the fraternity, be it local, regional, national or international" (http://www.nafra-sfo.org/meetings_and_resources.html). 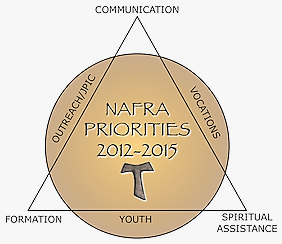 Thus, to me and I pray to you, the vital importance of the six NAFRA priorities above for the vitality of that circle of life, that circle or our world: our "ecclesial communities which are called fraternities." We all know that every Secular Franciscan fraternity deserves "capable and well-prepared persons" (General Constitutions Article 88.1) as Spiritual Assistants because the essential element of "vital Secular Franciscan fraternities" is the spiritual. Again, I have said and will continue to say that we are wasting our time in fraternity if we are not concerned at every meeting with ongoing, even daily, conversion, as we strive to turn away from sin and come closer in our thoughts, words and deeds to our Risen Savior Jesus Christ (Secular Franciscan Rule 7). Again, according to the 2012 Collated Annual Report from the Regions, we reported 472 Spiritual Assistants, up 6 from last year’s Report of 466 Spiritual Assistants, but down from 495 in 2011, and 506 in 2010) for 606 local fraternities and 30 Regional fraternities. We all know local fraternities that lack a formal, appointed, appropriate Spiritual Assistant, and I have been to Regions that have only one, often over-worked and venerable, Spiritual Assistant to serve the whole Region. At the National level, we have undertaken a serious effort since our 2012 Chapter to address this problem by setting up what has come to be called a Task Force on Spiritual Assistance Development. Our very capable sister Cyl Maljan-Herbelin was chosen by the NEC to chair this Task Force since she serves both as a member of the NEC (our National Treasurer) and as Secretary of the CNSA. Cyl is also a former Regional Minister. She has submitted both a Report from the Task Force and a Survey Summary of Spiritual Assistance from the twenty-two Regions that cooperated with her efforts. I commend her efforts, and I recommend her Report and Survey Summary. She will be available, of course, at our National Chapter for your questions and her input. "Spiritual Assistance ought not to become a matter of contention. All parties have the good of the Secular Franciscan Order at heart. There are fewer and fewer vocations to the Franciscan communities to which the altius moderamen is entrusted. That the numbers of friars from whom to draw for suitable and well-prepared Spiritual Assistance is diminished is not as sign of lack of love or care for the Secular Order. It is also to be noted that communication is a two-way street. Both sides must be called on to be more effective and more faithful in communication. "What all must take as a focus is how to work together to see that the goals outlined in all the documents (Rule, General Constitutions, Statutes for Spiritual Assistance, etc.) will be fulfilled. "Some things are very much absent in the inter-relations. The major superiors are often unaware of their own obligations to the Secular Order. Spiritual Assistants often are not involved in initial and on-going formation as much as they could or should be. Many fraternities are unaware of how to request spiritual assistance or to which friar obedience they are bonded. Other issues could be raised. "There is much to be done. Let us resolve that we work together in harmony, without rancor, to face this enormous challenge. There are ample opportunities for vital reciprocity and life-giving union as we wrestle with these situations." Vital Secular Franciscan fraternities need effective formation. Our hard-working National Formation Commission with its Chair Bob "Fitz" Fitzsimmons certainly did its work by delivering in 2011 the 460 page "FUN" Formation Manual with an unbelievably rich accompanying CD of Reference Material. We all still stand on this great work. Last year, 2012, focused on communicating these new Formation materials into the hands, hearts and minds of every Secular Franciscan, professed, forming or inquiring, in the United States. Most Regions reported offering "FUN" Manual Workshops attended by representatives of every, or nearly every, Local Fraternity in their Region. This year, despite significant family and personal health concerns, "Fitz" has agreed to finish his term (until NAFRA 2014) as National Formation Commission Chair. He has gathered a new National Formation Commission and selected a new Spiritual Assistant to lead us forward, from the great body of information in the FUN Manual to inner transformation, or as he writes in his yearly Report "beyond informed Franciscans to enflamed Franciscans." I commend his efforts, and I recommend his report. Those attending NAFRA 2013 will find a wonderful surprise on the agenda, for the first full day of our Chapter focuses on Formation leading to Transformation, under the guidance of Friar Dan Horan OFM. As Fitz writes in his Report: "Transformation of the person is not just becoming a textbook Franciscan (if there even is such a state) but being changed into a person who embraces the Gospel as Francis and is then transformed into a true lover." Let us all see how we proceed forward from this first full day of Chapter, October 16, 2013! Communication is also essential for vital Secular Franciscans and their Fraternities at every level. Again, your NEC has made a serious effort since NAFRA 2012 to see what we are doing right and what we can improve in our communication. Under the able leadership of Regional Minister Cindy Wesley, a Communications Committee has gathered electronically and focused on our communication needs and concerns. I strongly recommend you to read Cindy’s report and consider how you might contribute to the Committee’s stated purpose: "The Communications Committee will examine the current avenues of communication that exist in the Secular Franciscan Order of the USA, evaluate how well these avenues are working, and then set goals for improvement and/ or additional means of communication if necessary. These avenues of communication would include: between and within all levels of the Order, both from the higher levels to the individual members AND from the individual members to the governing bodies. (Also,) between the Order and the Church and the world." Cindy is gathering the Committee for a first face-to-face meeting on Tuesday, October 15, from one to three. I believe that any member of the NEC or any Regional Minister would be welcome to attend. Cindy, of course, and many members of the Committee will be available at Chapter for your questions and input. Personally, I commend Jim Wesley, the editor of our TAU-USA, and all his creative staff; the NAFRA Public Relations Committee with Bob and Mary Stronach; the NAFRA Computer Committee with its Chair Dan Mulholland; and National Webpage Master Vickie Klick for their consistent and admirable efforts to further effective communication with and among our 30 Regions, 600+ Fraternities and 13,000+ active, permanently professed Secular Franciscans. Every recent (from 2004 to 2013) issue of our TAU-USA publication is available through our National Webpage: http://www.nafra-sfo.org/tau-usa.html. In addition, email, both personal (tbellosfo@gmail.com), and through the NAFRA-L, NAFRA-ALUM and NAFRA-RM list serves, keeps me in contact with our widespread National family. Thanks to Dan Mulholland for keeping these list serves up and running well. Last year we did not have a youthful Youth Chair. This year we have Dr. Rob Breen. Last year we had not had a National Gathering on Youth for some years. This year we had the Confab at Our Lady of the Snows. To me, that is progress! I commend Rob’s efforts, and I recommend his Report, which shares: "In late fall 2012, I began the work of assembling a Franciscan Youth and Young Adult Commission, building a network among Secular Franciscans around the country interested in working with YouFra, and working collaboratively with members of the National Executive Council and JPIC Commission to host the Franciscan Summer Confab. I attended National Executive Council meetings, wrote articles for the TAU-USA, coordinated the H2O Project fundraising and Lenten solidarity event, and set up a Franciscan Young Adults webspace to foster communication and collaboration. A delegation of young adults was sent to the YouFra International Gathering / World Youth Day in Brazil in July 2013." Because of pressing family and work responsibilities, Rob will not be at our National Chapter for the whole time. He will be introduced when he’s there, however, so please seek him out with any questions or concerns. I also believe that one of the youths who attended World Youth Day in Brazil, Austin Yoo, a college student from San Francisco, if I remember correctly, will join us as well. As in previous years, this year’s Collated Annual Report from the Regions reports a wide variety of activities with Youth around the United States. I have learned that our youth are attracted by faith-based, welcoming Franciscan communities that are involved in prayer and in improving the world around them. As before, let us pray that all of us will do what we can to celebrate and encourage Youth. Let us pray for youthful hearts for all of our members that we might attract other youthful hearts, no matter the age. Further, if we are to live this year’s theme "Be the Bridge: Accept all People as a Gift of God," if we are "to build a more fraternal and evangelical world so that the kingdom of God may be brought about more effectively (Secular Franciscan Rule 14), then our Spirituality and evangelical love of the Lord and the Gospels must be witnessed out in the world. I cannot thank enough our Outgoing JPIC Chair Kent Ferris for his inspired leadership, for a strong JPIC Commission that he will stay on, for his work with the first-ever JPIC Rally in 2012 and the first-ever Summer Confab this year, plus his boundless energy and sense of fun! About the JPIC Commission, he writes in his Report, which I urge you to read: "The Justice, Peace & Integrity of Creation Commission is ready to continue serving the National Fraternity. The Commission is comprised of thirteen dedicated members from across the U.S., and three others who have expressed interest joining this group. The Commission has met regularly via conference calls, contributed to Commission Monthly Statements, written articles for the Tau, served as Faculty-in-Residence for Confab 2013, handled the responsibilities of the nomination and selection process for the annual, National JPIC Award, and have reached out to regional fraternity animators across the country. They are as committed to supporting each others’ projects and interests as they are in advancing those important to themselves." He concludes: "JPIC Commission work is not always easy. If approached only as an individual, global issues would be overwhelming. And likewise, responding only in charity would appear to meet a necessary need while also allowing one to avoid taking a stand, what some characterize as entering into political matters. But again, as people of faith who are in fraternity, we do not approach life as individuals. We are capable of so much more together. Our love for another will inform how we are to respond, both in charity, and obtaining justice. Let us not fear gaining the strength and courage to live the Gospel from each other. And then let us be courageous in our initiatives." From this JPIC Commission has come an excellent successor to Kent, our new JPIC Chair Carolyn Townes, whom I recently introduced to all of you. I’m delighted that both Kent and Carolyn will join us at our NAFRA Chapter. Please thank Kent and please welcome Carolyn. Please welcome as well the 2013 JPIC Award winner Dr. Margie Sweeney. Dr. Sweeney is a wife, mother, family physician, Secular Franciscan and founder of the nonprofit charity, Helping Hands Healing Ministries, Inc., seeking to lessen poverty in developing countries. She serves as Vice Minister of her local fraternity and works with the formation team. She will receive her well-deserved Award Thursday morning, October 17. 2013 is a year of transition in our Vocations efforts. I recommend the Report by our long-time and beloved Vocations Minister Marie Amore, who has also submitted her resignation. God bless you, Marie, for all your gifts and contributions to the Secular Franciscan family at every level! At the same time, I welcome a newly formed Vocations Committee, currently consisting of Jane DeRose-Bamman, Jeff Ramirez and Deacon Phil Simeone. Phil reported health concerns, but both Jane and Jeff attended the Summer Confab. Jeff has been chosen Vocations Chair, and, I believe, that he will attend our National Chapter. Please be ready for any advice or suggestions to Jeff and to us on Vocations AND on a person to answer our 1-800 number as Marie has done for so many years. 2012-2013 has also been an active year for our Ecumenical/Interfaith Committee under new leadership with Anne Mulqueen, our Archivist Sharon Deveaux, our Historian Bill Wicks, and our already-mentioned Public Relations Committee, and our Computer Committee especially here for their continuing work on maintaining the database. Thanks to all of you for all your hard work and Reports, which I recommend. I apologize to Bill that I was not able to attend his Summer Seminar on our Secular Franciscan History in the United States. I heard from several attendees that it was very informative and a lot of fun! I did attend an Ecumenical/Interfaith Session, and I welcome to our Chapter Deacon Joan Verrett (TSSF) and CJ Boylan (OEF). Joan has been with us for many wonderful years, and, I believe, this will be CJ’s second time. Of course, our beloved Anne Mulqueen plans to be in attendance, and always welcome are Bob and Mary Stronach, our Public Relations Co-Chairs and all the Computer Committee who will attend this year’s Chapter. Bob Herbelin and Roger Raupp will hold a Database Workshop Thursday evening October 17 that’s not to be missed! As I said at the beginning, that TAU Cross in the circle of Fraternity is the individual Secular Franciscan. Our Fraternities can only be as vital as the individual members. As I confess that I haven’t always heeded my own advice, so permit me to advise you in somewhat the words St. Paul advised St. Timothy: "Attend to yourself and to your Fraternity; persevere in both tasks, for by doing so you will save both yourself and those in your Fraternity" (cf. 1 Timothy 4:16). As we all have our stories, here is mine. As I shared with you in 2011 the joy I felt working down in Manaus, Brazil with Jim Flickinger, head of Amazon Relief (http://www.amazonrelief.org/), and in 2012 teaching English, washing dishes and generally getting in the way of Dr. Tony Lazzara, the residents and staff of Hogar de San Francisco de Asis down in Chaclacayo, Peru (http://www.villalapazfoundation.org/), may I tell you about the parish and mission work I did this summer in Garzon, Colombia, at the personal invitation of Father Elcias Trujillo Nunez, the Pastor of St. Joseph Parish in Garzon? This mission proved more dangerous, more humbling and more faith-filled than I had anticipated. I say more dangerous because Garzon is largely an agricultural town in primarily an agricultural area around the department (state) of Huila, and this summer was the site of considerable civil unrest by the compesinos or farm workers, because of low prices for local produce and thus a continuing lower standard of living. To protest these low prices, the farm workers, supported by others, had closed roads leading into the larger cities and towns to prevent imported produce from being delivered. Thus, when we flew into Neiva, the capital of Huila, Father Elcias picked us up, but was not sure we could make it to Garzon because of these roadblocks. We did make it, but once we were actually denied access to where we wanted to go, and it was an angry, uncomfortable situation. In addition, and I apologize to all Colombians, but from my limited perspective, the Colombia I experienced is largely a police state with heavily armed police and military almost at every street corner and even marching down the main aisle at one Mass I attended with their heavy weapons and live ammunition. I was really scared! I say the mission was humbling because although I stayed at the spacious Rectory at the Parish, the shower had only three temperatures: cold, colder and coldest; and early Saturday morning before the 6 am Rosary and 6:30 am Mass was absolutely the coldest. The Rectory also lacked any screens, and the mosquitoes came in constant attack. Shame on me for being so spoiled as to want hot water and screens on the windows when so many of these good people lacked so very much more, and I felt so helpless to give them the medical care, the food, the shelter that I would have lacked in their situation. Most importantly, I say faith-filled because as I made Communion calls among these good people who did lack medical care, adequate food and comfortable shelter, perhaps to compensate, God has given them so much faith, hope and love. Every Mass I attended or where I assisted Father was packed with people of all ages, even daily Mass, even at 6:30 am on Saturday morning! When Father and I drove up into the rugged hills and mountains around Garzon to bring God’s Word and Sacraments to the people, they were so thankful. They sang so loudly and well. I could feel their strong faith! Thus, I am delighted to be home with hot showers, screens on the windows, air conditioning, no roads closed by angry farm workers and no heavily armed military on every street. But, yes, I miss the great faith of these simple people, blessed by God with their warmth and hospitality to this outsider with his horrible Spanish and gringo customs! Gracias a Dios! With so many, I share my joy that our new Holy Father Francis has chosen the name of "Our Holy Father, Francis of Assisi, Deacon, Founder of the Three Orders." With all of you, I feel he both "raises the bar" for all of us in so many ways and offers "daily publicity" for our Secular Franciscan Order! Just yesterday, Pope Francis said about St. Francis in Assisi: "Saint Francis of Assisi bears witness to the need to respect all that God has created, and that men and women are called to safeguard and protect, but above all he bears witness to respect and love for every human being. God created the world to be a place where harmony and peace can flourish. Harmony and peace! Francis was a man of harmony and peace. From this City of Peace, I repeat with all the strength and the meekness of love: Let us respect creation, let us not be instruments of destruction! Let us respect each human being. May there be an end to armed conflicts which cover the earth with blood; may the clash of arms be silenced; and everywhere may hatred yield to love, injury to pardon, and discord to unity. Let us listen to the cry of all those who are weeping, who are suffering and who are dying because of violence, terrorism or war, in the Holy Land, so dear to Saint Francis, in Syria, throughout the Middle East and everywhere in the world." May both Pope Francis and Father St. Francis intercede for us and have God show us what is ours to do AND supply the grace to do it! Let us always pray for one another.